It became clearer and clearer the Front Street property was my best option. So I took the next step and hired someone to demo and remodel the inside and outside of 312 Front Street in downtown Laurel. As I look back on all of the summers I spent in Laurel only two doors down from that very building, I can’t help but think God’s plan was already laid out for me and my son by the time I was about 7 or 8 years old. I started visiting my sister and brother-in-law at their business, Lott Furniture Co. as a small child (there’s a HUGE age gap…HUGE!) 😂 and every summer I came back for two weeks and “worked” for Ms Nellie Rowell for those two weeks. I thought it was so cool to be able to walk from Lott to Fred’s or Trustmark all by myself doing errands for Lott. So I knew the area well and so did Michael (he followed in my footsteps and stayed with my sister many times just like I did). In the midst of the demo of the Front Street building, we were moving back into our newly renovated home by HGTV’s HomeTown and trying to get settled in. We were so happy to finally get into this amazing home with history and have the luxury of a custom kitchen, living room, studio and entryway. We loved every square foot of it and still do. I must tell you, even though I had built a home in Houston, Texas and decorated several, it was pretty stressful renovating a building and hiring contractors. I can’t imagine if I had taken on a building as big as Arthur’s. The renovations were supposed to be finished by September. They weren’t finished until the middle of November. I had ZERO inventory ordered, Zero furnishings purchased except for an awesome Bassett leather sofa and two custom chairs from Lott that were orders. I had zero supplies…nothing. Nada. I had no place to store anything and didn’t have the money to rent storage buildings. There were still days that I couldn’t get out of bed for the pain was too much to face. My son was suffering too. We were there for each other. Our family and the people of Laurel embraced us like nothing I have ever seen before. God winks; sometimes those winks get you through your one step at a time moments and you desperately keep searching for the next one. I had a few here and there. I had a lot of pressure from different people asking what I was going to do with the buildings, and for those first several months I really couldn’t think clearly enough to answer any of those questions. I cannot tell you a date that my sun shined, the clouds broke away, and I was happy again. It was a slow fade. In fact, one step led to a bigger step and so on. One big blessing that happened was that we were accepted as one of the families to get their home remodeled by HGTV’s HomeTown. We lived with my sister and her husband through the remodel. As grateful as we were to my sister and her wonderful husband, Michael and I didn’t feel settled into Laurel yet because we still were not in a home that we could settle into. So for those few months, all of our crap was crammed into one bedroom. Surprisingly to my sister, her husband and myself, we ALL got along pretty dang good considering the circumstances. Michael and I were BEYOND excited to know we could move into a newly and much needed renovated home. During the time we were staying with my sister, I had to make a decision on what to do with the Arthur’s building and what I will refer to as the Front Street building. After being gutted, Arthur’s needed a lot of work and is such a huge space that I couldn’t see myself starting our new lives with so much debt from restoring such a large building. The more I thought about the Front Street building, the more I liked the idea of using it instead of the Arthur’s building. I think ALL of my friends and family had been telling me for months that the Front Street building was my best opportunity. They all may have gotten very frustrated with me taking so long to make a decision but it was something that I had to take time processing. I had to let the dust settle from the divorce long enough for us to gain what little footing we could before I was mentally able to make that decision and I had to be the one to make the decision. Almost a year and a half since my last blog has passed. So many life altering things happened in that 15 months. Shortly after the August 2017 post and after 23 years of marriage, I reluctantly filed for a divorce. No one (that I know of) ever sets out for a divorce. I tried for so very long. I tried for us, for the kids, and for Christianity. Some things just aren’t meant to be no matter how hard you pray. Yes, God can save marriages but only if both parties are willing to change, work hard at mending the hurts, and continue to love each other. Not many divorces end pleasantly. My divorce was far from pretty and unfortunately and ultimately left lasting scars on myself and my children. I wish things had worked out differently. This isn’t bashing session on ex-husbands. This blog is about my journey and the divorce was and is still a part of my journey. We had such big plans together for the Arthur’s building and the second building we had purchased in Laurel, Mississippi. Arthur’s was going to be a huge art gallery and four AirBnB’s on the second floor. The second building was purchased with plans to put in a restaurant. With the divorce looming, it was unclear what would happen with both of the buildings if anything. My world for 23 years was crashing down around me faster than I could adapt and readjust. Yes, it was my decision so you might be saying I deserved every bit of what I was dealt. If you knew the whole story, you might see things in a different light. One day I may share what I and my children went through but that’s up to me to decide. So judge if you wish but also give grace. As the life I thought I had seemed to dissipate right before my eyes, and things in some parts of the marriage were made crystal clear, I knew I had no choice but to leave as soon as I could. I felt the best place for me and my son to go would be the place we had family and the possibility to rebuild a different kind of life. I chose Laurel because if there was the slightest possible miracle from God, it would be that some way, some how, I would still be able to open the gallery; although at that time, I wasn’t believing in any miracles. I was mourning a 23 year long marriage that only existed in my mind and not in reality. Nothing was what I thought it was. Nothing. I had poured everything I had into making my marriage work and to face the facts was one of the most difficult parts of the divorce. I felt God had failed me and left me in the wilderness. I felt I had failed God and an entire church back in Houston, Texas before we moved to Franklin, Tennessee. Not having a game plan for the divorce because it came so suddenly put me in a panic. I had some education and a good field of study but no real source of income at that time. The divorce started in September of 2017 and my son and I were gone from Franklin, Tennessee (a place we truly loved) by December of 2017. We arrived in Laurel by way of the largest UHaul truck they could rent us. Half of the belongings from our home in Franklin were packed in that truck along with our dog, Scottie Pippen. The next few months were sort of a blur. There were some major adjustments that my son and I had to go through. There were friends and family members lost along the journey that might not ever be parts of our lives again. If you’ve never been through a divorce, trust me when I say it felt like I was trudging inch by inch through a four alarm fire and the smoke was taking over my body and burning from within. The pain was almost unbearable. Thankfully, the God that I thought left me in the wilderness sent angels along every single step of the way. Before the opportunity of purchasing Arthur’s became a reality I had been researching places to rent to display my artwork. I never had a clue that we would have a chance at owning a building. So when purchasing the building was literally dropped in our laps, I knew I had a lot of work ahead of me and finding a name was top priority. While in the throws of working on the purchase of the Arthur’s building in downtown Laurel, Mississippi instead of continuing the search for rental property, it changed to researching the history of Laurel and the history of art in Mississippi. I was searching for possible information that would lead me to a meaningful name for the Arthur’s building. After several hours of research, I found it. In paralegal school, we called it the “smoking gun” which meant the evidence needed to prove a person’s guilt or innocence without a shadow of doubt. In this case, my “smoking gun” was a small obscure room in the Pinehurst Hotel. In 1893, Laurel MS opened it’s first lumber mill. Laurel was no stranger to the latest technology in the land. 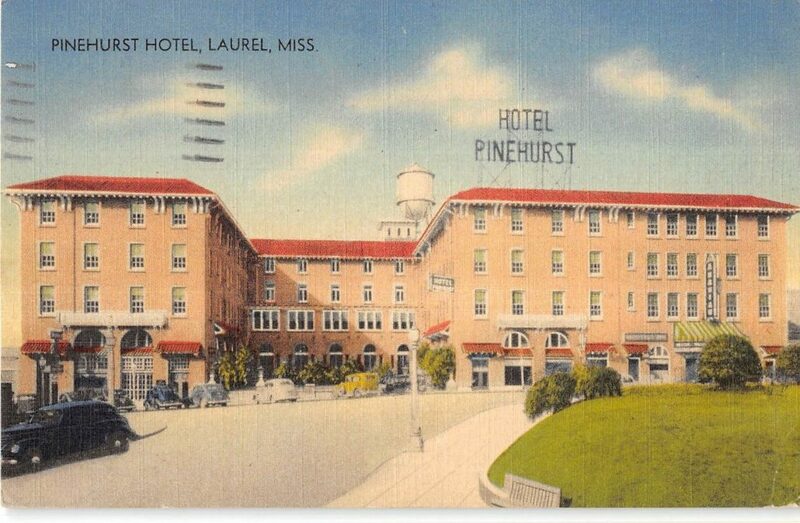 With the large amount of growth in population the lumber mill as well as the railways brought to Laurel it was no surprise that 21 years later, 1914 to be exact, The Pinehurst Hotel was born. It was strategically placed up the street from the train depot so that guests would have easy access to the best lodging in town. The Pinehurst bustled with transients on a daily basis and quickly became the center of entertainment for the entire city of Laurel. The Pinehurst was very importantly, one of the first air-conditioned hotels in the sweltering south. In addition, the hotel included the Arabian Theater which housed plays, movies and special events. Most transients remember the Pinehurst for it’s cool air-conditioned rooms, it’s fine dining, it’s entertainment, or it being a gathering place for the who’s who among locals. Not many remember a certain special place that goes unrecognized. In fact, most articles never mention this particular room being in the Pinehurst. In 1948, the Mississippi Art Colony was organized at the Allisons Wells Hotel in Way, Mississsippi. It flourished there for 15 years. The owners of the Hotel, John and Hosford Fontaine ran the Art Colony until the Hotel was destroyed by fire. In 1963, the main members of the Colony found a new home and re-organized at Stafford Springs, close to Heidelberg, Ms. At that time, the Colony did something very few art groups had managed to succeed at. The group was managed and directed by the artists themselves. In 1970, the Mississippi Art Colony asked the Pinehurst Hotel in Laurel MS if the hotel had a place for the Colony to meet on a regular basis. 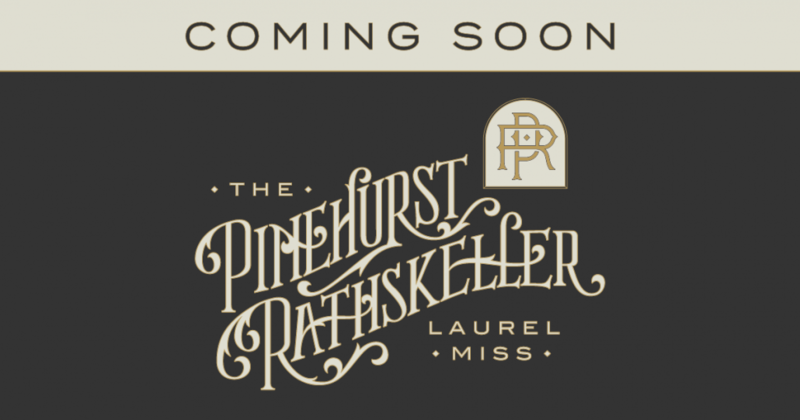 The Pinehurst provided a studio in a basement space formally referred to as the rathskeller. The word rathskeller referred to the basement or hidden beer tavern or in some cases a speak easy. The Colony notes in their history section of their website they had several drop-ins from the alley demanding beer. The Colony also expresses how hospitable the city of Laurel was to the artists; inviting them to events, parties, hosting shows at the Lauren Rogers Museum. All of this history led me to the only appropriate name for the Gallery which is the Pinehurst Rathskeller Gallery. This name is in appreciation to those who welcomed the art colony with love and hospitality as well as the longest artist run art colony in the nation, which led to recognition by the Smithsonian Musuem for this monumental achievement. Soon, Laurel’s (and Mississippi’s) artists will have a home once again, right here in Downtown Laurel. Construction is underway, and I can’t wait to share this beautiful space with all who will call her home. Click here to follow us on Facebook for updates and to become a part of Laurel’s artists’ community! After making the transition to Greenville, Mississippi, our Italian family thrived. They still went through very hard times. White people didn’t like Italians. There was a case in New Orleans where five Italian men were framed and hanged for no reason other than their heritage. My family is no stranger to racism or slavery (which came in a pretty package called sharecropper). Doing research on my heritage, I found an article in the Delta Democrat Times about Italian immigrants. The author highlighted the fact that she was shocked at how thrifty Italians were (eluding to Americans thinking Italians were dumb). The other two main obstacles were the great flood of 1927 and the outbreak of yellow fever. Our family somehow survived both. When I was born, things for Italians had changed in Mississippi. We were a large part of our community. We had a thriving Catholic Church and private school. Our family was so large that at any given event there were at least 40 people there and they were ALL blood relatives. On Sundays after church there was always a spaghetti supper at our house. I helped make the meatballs. It seemed like we cooked that spaghetti all day. And we did. The sauce cooked for hours and then at the last hour, the meatballs were added. I don’t know how we did it but there was always enough pasta for the entire family. On holidays, we would gather at our parent’s house about two weeks before the actual holiday to make tortellini. We made the dough and the meat filling and in the end, had about 1000 tortellini to be frozen and saved for the upcoming holiday. Those are some of the best memories of my life: not the toys I got from Santa, or finding the golden egg, or getting candy from the Easter bunny, it was the togetherness. No one lived out of town. Everyone lived right there in Greenville where one of the biggest events of the year was the Catholic Parish fair. EVERYONE was at the fair and of course, there was spaghetti served for anyone who had a ticket for a plate. I never knew anything different than what went on in that little town. I was a happy child but, as anyone knows with a large family, there will come traumatic times; and there were. One of the largest tragedies in particular was my oldest sister, Joyce’s death. I was five years old at the time. On February 12, 1978, Joyce turned twenty-one. That same day, she lost control of her car and was found dead the next morning. I answered the door for the poor man who was sent to tell my parents. After that, everything changed. Everything. Our family business went under a few years after Joyce’s death due to a franchise named Auto Zone coming to town. Auto Zone bought large quantities of parts, which enabled them to sell at much lower prices. My father’s auto parts business just could not compete. Most of my siblings were grown and married by this time. My closest sister in age, Cathy, was in high school. Cathy and I were the ones who really felt the brunt of our father’s business going under. We moved out of our home that was full of all of those amazing family gathering memories. My mother and father both ended up working for factories in town. And somewhere in all of this chaos, my love for art began. The first piece of artwork I can remember well was a finger painting. I LOVED finger painting. Mom was gone away from the house and I remember trying to find something wonderful I could paint on to give my mom when she got back home. Low and behold in my mother’s cedar chest there was a perfect gold and white checked box. The inside was covered in brown paper- perfect for a finger painting. To me, the inside of this box was just calling for a painting. It even had it’s own frame having sides and all. So in my best finger painting mojo, I decided to paint a big red flower and I think maybe some green grass and of course the yellow sun…who could forget the sun?! I was proud. My creation was perfect. I couldn’t wait to give my mother this gift when she got home. I waited for it to dry with anticipation. As soon as my mother arrived, I gave her what I thought was the “Picasso” of finger paintings. Much to my surprise when she saw it, she got a strange look on her face and I knew it wasn’t the look of pleasure. To this day, my mother still has that “oh so perfect box for a finger painting”. She tucks it away in her cedar chest and inside this box is my oldest sister, yes, the one who passed away, Joyce’s wedding album. Today, we both laugh at what I thought was the perfect gift; and in a way, in my way, it was. I grew up in what is known as the Mississippi Delta. My hometown was Greenville; a small town that was a throughway for tow boats because it sits on the very edge of the mighty Mississippi River. The towboat industry was big revenue for the town as well as Comet Rice, Vlasic, and hundreds of cotton, soy and cattle farmers. My father and mother met when they were around five and seven years old. They lived across the street from each other. They married when my mother was fifteen. In all, seven children were born from about the time my mother was 17 until she was 38 years old. I was the baby. We were born and raised Catholic and went to Catholic school. I like to think I was born with a little more grit in my veins than most kids. You see, my mother’s family was Italian. Her grandparents came straight from Italy in 1895 and 1896. They came in the steerage section of a passenger ship after being recruited by some well-known plantation owners and politicians. Caterina and Pietro Dallriva were told that if they moved to America, they would work the cotton fields in exchange for a house and land that would be all theirs. What they didn’t know was that they were in debt $2000.00 for the tickets to America as soon as they set foot on the ship. Caterina, Pietro and their children ended up on a plantation called Sunnyside. It was located in Sunnyside, Arkansas now known as Chicot County. Sunnyside was conveniently located at the edge of the Mississippi River as well. The entire family picked cotton every day. Some days they picked so much cotton that their fingers bled. They lived in shotgun shacks along side other Italian and African American families who also worked the plantation. The living conditions were well below poverty level and about as unsanitary as a place can get. It didn’t take long for Pietro to figure out that they would never own the land or the house they lived in. So, the Dallriva’s along with 30 or so other families came up with a plan. Some how all of these families found a way to cross the mighty Mississippi River in the middle of the night to escape the plantation. That is how Greenville, Mississippi gained such a large Italian, Catholic population; and that was the beginning of my grit.